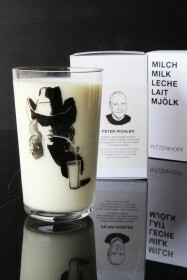 This milk glass has been designed to celebrate Ritzenhoff's 25th Anniversary and is a great design to add something different to your everyday drinking glasses. To celebrate 25 years in production, Germany's best-known high-tech glass factory; the family-run business RITZENHOFF, have collaborated with 29 of the world's top creatives to present a series of drinking vessels, each beautifully adorned with their own unique design. Some funny, some ironic or with aesthetic or graphic designs, each glass characterises the individual artist or creative themselves and are all beautifully boxed and presented. The simple but brilliant principle for the Milk Glass is to use the opaque white of the milk to create a blank canvas for the individual artists and designers to express their ideas. 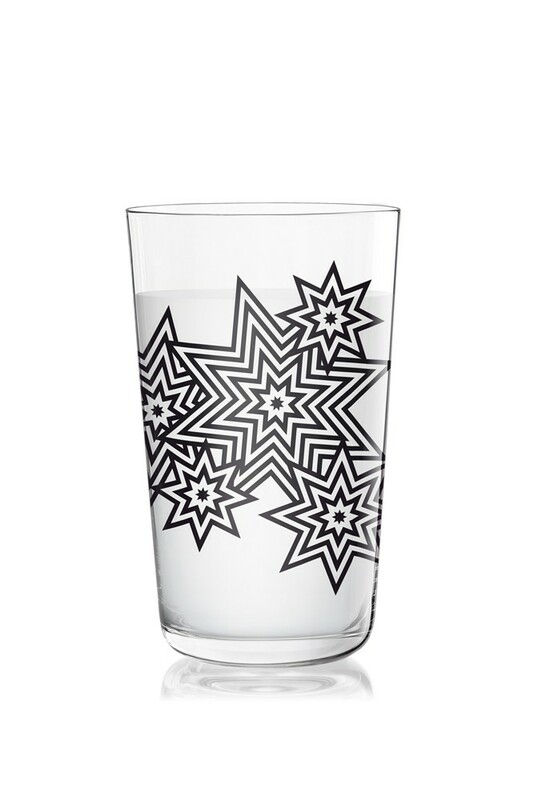 Designs are exclusively featured in Black, making this glass the perfect monochrome style statement. Each glass in this beautiful range makes the perfect gift to any disconcerting design lover, an admirer of beautiful things or quaffer of a beverage or two! This collection is quite simply the modern designer collectables of our time. We have cherry-picked a selection of our favourite designs, including this one by Sieger Design. Christian and Michael Sieger have created iconic tableware and bathroom items within their agency. Characteristic features are the archetypical designs and their intuitive feel for long-term trends. One of the successes of their career is the conceptual development of the Ritzenhoff brand (1992) and its strategic unfolding in the 1990s where they were able to cover all disciplines of the design process in-house and have worked with Ritzenhoff again on the conceptualisation and management of the 25th Anniversary collaboration. Christian and Michael Sieger were the first to create a design on the Milk Glass for Ritzenhoff back in the 90’s which fast became a coveted collectors’ item.